Every year, many outstanding students compete to win the prestigious IL-ITE student paper award, but only one student can take home the honor. 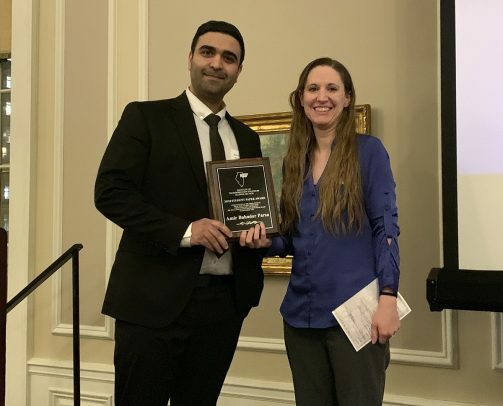 This year, Amir Bahador Parsa, a Ph.D. student in the civil and materials engineering, won the Best Paper Award with his paper “Real-time Accident Detection: Coping with Imbalanced Data.” He received a $1,000 award during the ITE Illinois Section Annual Banquet at the Union League Club of Chicago on Jan. 25. The Institute of Transportation Engineers (ITE) is an international professional society of more than 13,000 transportation engineers. Parsa started his Ph.D. program in fall 2017 under the supervision of Mohammadian, and his research interests revolve around transportation planning and the application of data science in transportation. He is working on several research projects funded by the Illinois Department of Transportation and Argonne National Laboratory, which include real-time prediction of travel time for Chicago expressways, defining best practice operation of reversible lanes on the Kennedy Expressway, and investigating the impact of autonomous vehicles on traffic flow at the national level.